Bearing in mind the gradual reduction in lion population numbers due to increased human population growth and activity in Africa, lion infanticide appears to be detrimental to the survival of the species as a whole. It is a very selfish and egocentric activity by male lions. It is entirely natural but it seems counterproductive in the artificial human world. The process starts when young male lions of about 2-4 years of age are pushed out of their natal pride (the group that they were born into). This is because their fathers lose out to intruding males. They form coalitions to aid in survival as it is harsh for young males living nomadically. Some males are not evicted until fully grown which makes surviving easier. The coalition of males then take over a pride. They oust the existing males. There are fights, sometimes fatal. Clearly the larger the group of males, the greater the chance of success in gaining access to a pride. A group of female lions are not left alone for long. The new males then have access to females. This a traumatic time and a time for lion infanticide. New males “chase and kill any cubs, subadults, or even adult females if the females do not mate with them”1. The whole process is driven by the male lion’s need to have his own offspring. The objective is achieved in a testosterone fuelled, brutal manner. All the offspring in the pride will then be genetically related to the original intruding male coalition. Females sometimes kill cubs from a rival pride. The above image is a screen shot from the video below. There are no still images that I can find of lion infanticide. This video may be an amalgam of various downloaded videos but it does show the actual killing of cubs and it is hard to look at. Please note: Videos sometimes get pulled off YouTube leaving a blank screen. What do the females do when confronted with strange males who wish to kill their offspring? Cats, domestic and wild are known to be fierce defenders of their babies. Some females “gang up” and defend their cubs. 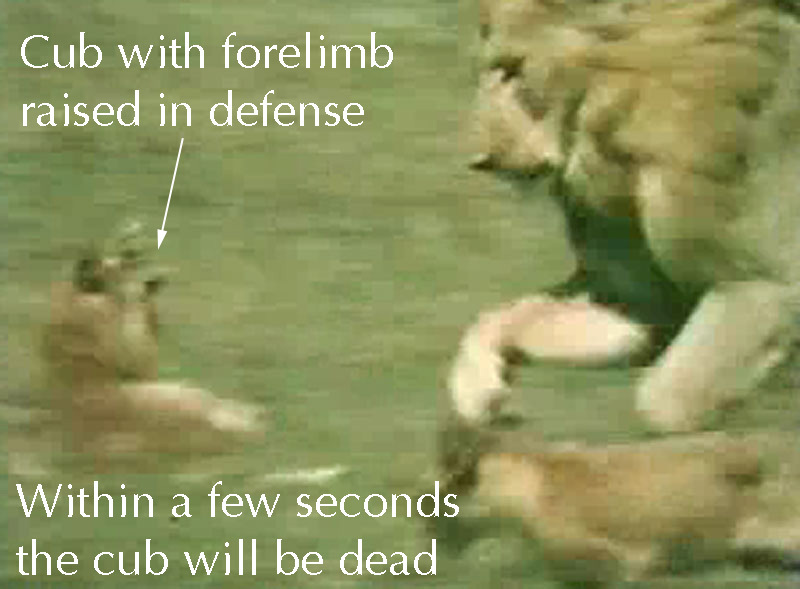 This carries great risk of injury for the lionesses. Some leave the pride and take their cubs with them. it is said that an already pregnant female will mate with an incoming male to try and confuse the male into believing the new offspring is his. However, it is suggested that some lionesses who are pregnant at the time of the male takeover, spontaneously abort their pregnancies, while others abandon their cubs2. References: (1) Great Cats – Majestic Creatures of the Wild page 84-85 – ISBN 0-87857-965-6 and (2) Biology @ Davidson – many thanks. This entry was posted in Lion, Wild Cat Species and tagged cat behavior, cat infanticide, facts about lions, lion behavior, lion infanticide by Michael Broad. Bookmark the permalink.